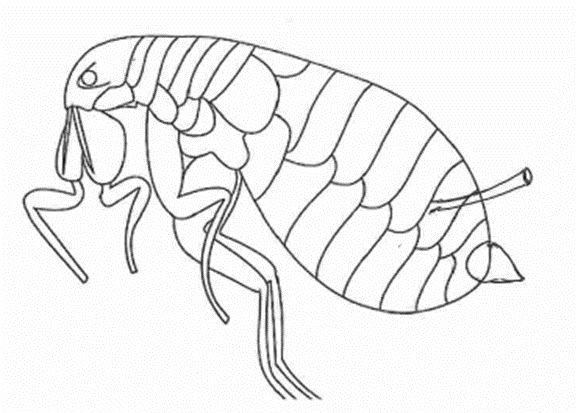 An aphid is… a flea, a louse, and even a marine mammal! Earlier this year I wrote about the debate that rages about the correct way to talk about thrips during which I got distracted and ended up writing about their names in different languages. It turns out that I am not alone in being curious about international insect naming. I have just finished reading Matthew Gandy’s excellent book Moth, where he waxes lyrical about the different names used to describe butterflies and moths around the world. This, of course, made me wonder what aphid would turn up, so armed with dictionaries and Google Translate, I traveled the world to see what I could discover. There are a lot of languages so I am only going to highlight a few versions of aphid that I found interesting or surprising. According to The Oxford English Dictionary, Linneaus coined the word Aphides, which may (or not) have been inspired by the Ancient Greek ἀφειδής‎ (apheidḗs) meaning unsparing, perhaps in relation to their rapid reproduction and feeding habits. The modern spelling of aphid seems to have come into being after the Second World War, although you could still find aphides being used in the late 1940s (e.g. Broadbent et al., 1948; Kassanis, 1949), and it can still be found in more recent scientific literature where the journal is hosted in a non-English speaking country. Many aphid names are very obviously based on the modern Latin word coined by Linneaus, although in some countries more than one name can be used, as in the UK where aphid is the technical term but blackfly and green-fly are also commonly used. 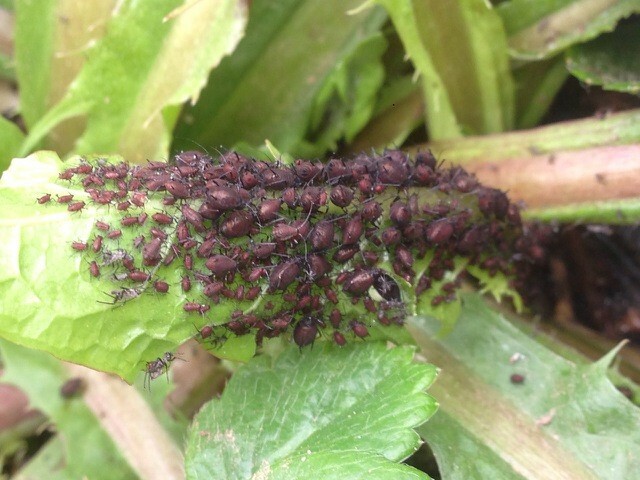 More common are those names that relate to the vague resemblance that aphids have to lice and to their plant feeding habit. The term plant lice to describe aphids was commonly used in the scientific literature up and into the early 1930s (e.g. Mordvilko, 1928; Marcovitch, 1935). 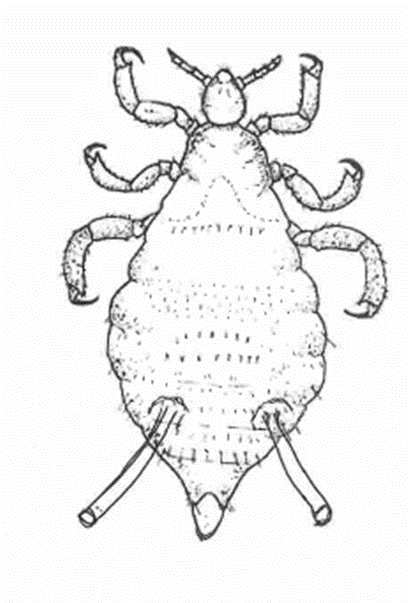 If you draw siphunculi on to a louse and add a cauda to the rear end you can just about see the resemblance. In Turkish, aphid is yaprak biti which roughly translates to leaf biter. There are then a few languages where there appears to be no connection with their appearance or feeding habit. In Lithuanian, where aphid is Mszyca, which looks like it might be derived from Myzus, an important aphid genus, aphid also translates to amaras which means blight. In the case of a heavy aphid infestation, this is probably an apt description. I was also amused to find that whilst the Welsh have a name for aphid, Scottish Gaelic does not. 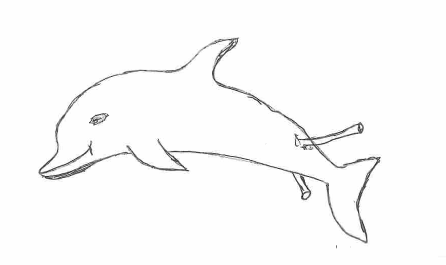 My all-time favourite, and one for which I can find no explanation at all, is dolphin. According to Curtis (1845), aphids on cereals in some counties of England were known as wheat dolphins. I was also able to trace the use of this name back to the previous century (Marsham, 1798), but again with no explanation why this name should have arisen. Broadbent, L., Doncaster, J.P., Hull, R. & Watson, M.A. (1948) Equipment used for trapping and identifying alate aphides. Proceedings of the Royal Entomological Society of London (A), 23, 57-58. Curtis, J. (1845) Observations on the natural history and economy of various insects etc., affecting the corn-crops, including the parasitic enemies of the wheat midge, the thrips, wheat louse, wheat bug and also the little worm called Vibrio. Journal of the Royal Agricultural Society, 6, 493-518. Kassanis, B. 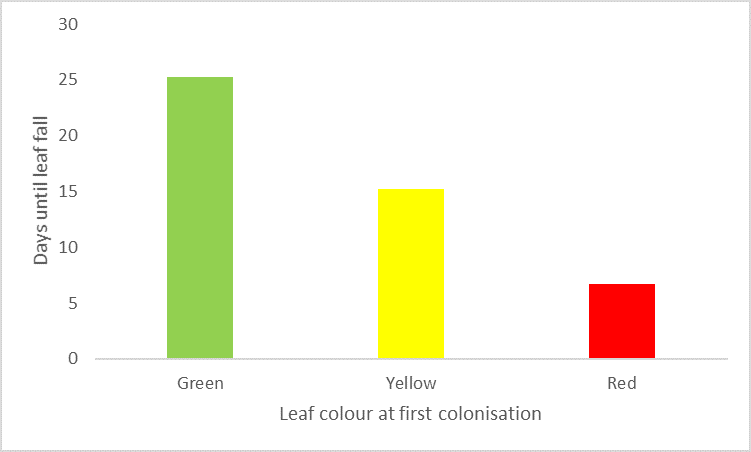 (1949) The transmission of sugar-beet yellows virus by mechanical inoculation. Annals of Applied Biology, 36, 270-272. Marcovitch, S. (1935) Experimental evidence on the value of strip farming as a method for the natural control of injurious insects with special reference to plant lice. Journal of Economic Entomology, 28, 62-70. Marsham, T. (1798) XIX. 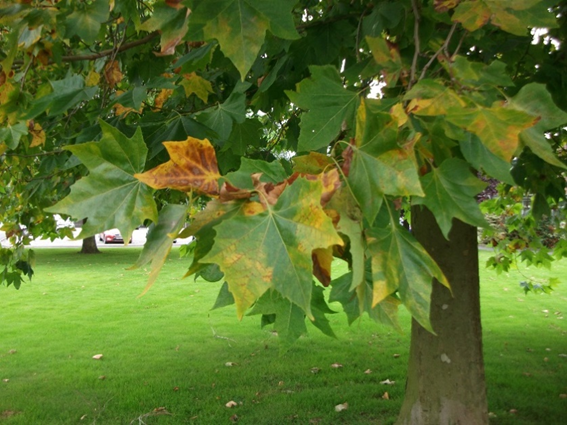 Further observations on the wheat insect, in a letter to the Rev. Samuel Goodenough, L.L.D. F.R.S. Tr.L.S. Transactions of the Linnaean Society of London, 4, 224-229. Mordvilko, A. (1928) LXX.—The evolution of cycles and the origin of Heteroecy (migrations) in plant-lice , Annals and Magazine of Natural History: Series 10, 2, 570-582. “This is Simon Leather, he’s an ecologist, albeit an applied one” Thus was I introduced to a group of visiting ecologists by my then head of department at the Silwood Park campus of Imperial College. As you can imagine I was somewhat taken aback at this public display of the bias that ‘pure’ scientists have against those that they regard as ‘applied’. I was (and still am), used to this attitude, as even as an undergraduate doing Agricultural Zoology when we shared modules with the ‘pure’ zoologists, we were regarded as a slightly lower life form J Working in Finland as a post-doc in the early 1980s it was also obvious that there was a certain degree of friction between the pure and applied entomologists, so it was not a phenomenon confined entirely to the UK. 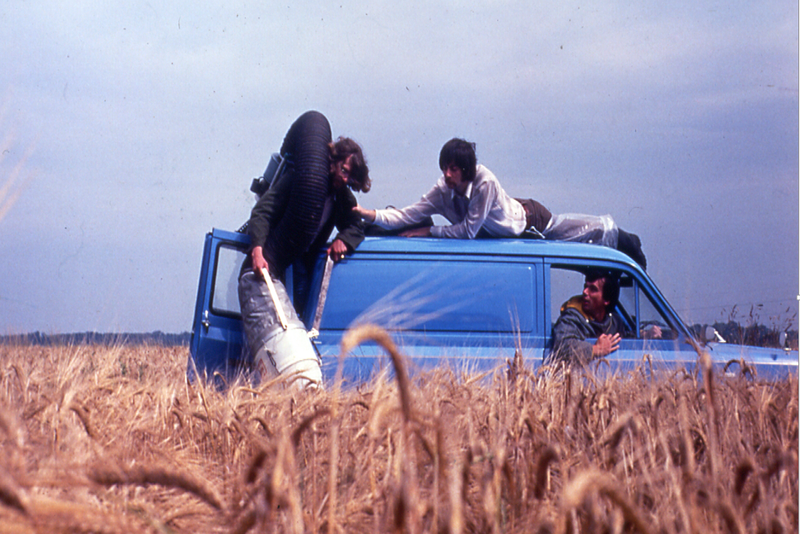 To this day, convincing ecology undergraduates that integrated pest management is a suitable career for them is almost impossible. I was an ecologically minded entomologist from early childhood, pinning and collecting did not interest me anywhere near as much as insect behaviour and ecology, but I knew that I wanted to do something “useful” when I grew up. Having seen my father in action as a plant pathologist and crop protection officer, it seemed to me that combining entomology with agriculture would be an ideal way to achieve this ambition. 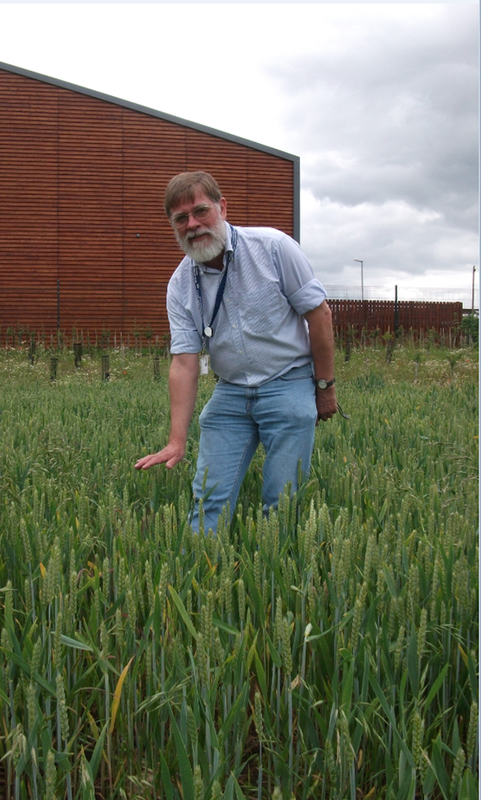 A degree in Agricultural Zoology at Leeds and a PhD in cereal aphid ecology at the University of East Anglia (Norwich) was the ideal foundation for my chosen career as an applied ecologist/entomologist. I started my professional life as agricultural entomologist working both in the laboratory and in the field (cereal fields to be exact), which were easily accessible, generally flat, weed free and easy to manipulate and sample. In the UK even the largest fields tend to be visible from end to end and side to side when you stand in the middle or edge (even more so now than when I started as wheat varieties are now so much shorter, less than half the height they were in 1977). See the post script to see what wheat used to look like. Laboratory experiments, even when working on mature plants were totally do-able in walk-in growth rooms, and at a push you could even fit whole earing wheat plants into a growth cabinet. I then spent ten years working as a forest entomologist, where field sites were the exact opposite, and extreme measures were sometimes required to reach my study animals, including going on an official Forestry Commission tree climbing course. Scaffold towers for really high work, but expensive (and scary on sloping hillsides). 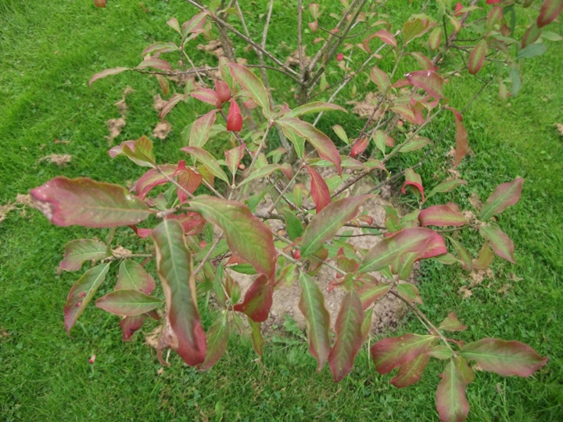 And as for lab work, not a chance of using mature plants or even plants more than two to three years old. 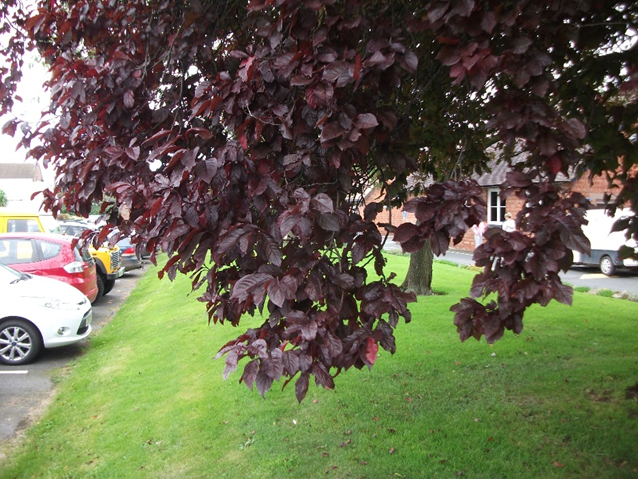 Excised branches and/or foliage (rightly or wrongly) were the norm*. The real fun came when it was time to submit papers. Journal choice was (and is) very important. As Stephen Heard points out, journals have a ‘culture’ and it is very important to pick a journal that has the right editorial board and ethos. The laboratory work never seemed to be a huge problem, referees (perhaps wrongly) very rarely criticised the use of young plants or excised foliage. I was able to publish the output from what was a very applied project, in a range of journals from the very specialised to the more ecological. This selection for example, from 1985-1987 (Leather, 1985, 1986; Leather & Burnand, 1987; Leather et al., 1985), appeared in Ecological Entomology, Oecologia, Functional Ecology and Bulletin of Entomological Research respectively. Papers reporting field-based work were a little bit harder to place in journals outside the mainstream forestry ones, particularly when it came to experimental work. One of the problems was that ecological referees unused to working in forests tended not to have a grasp of what was involved in setting up and servicing an experiment in a forest plantation or stand. A farmer has no great objection to an entomologist removing 100 wheat tillers a week from his 2 ha field (at 90 stems per metre2, even a 16 week field season would only remove a tiny fraction of his crop). A forest manager on the other hand with a stocking density of 3000 stems per hectare would look askance at a proposal to remove even 100 trees a month from a hectare plot, especially if this was repeated for seven years. 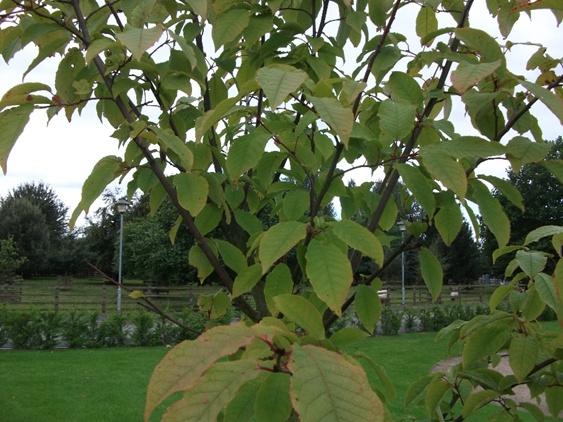 Sample size was thus a problem, even when using partial sampling of trees, e.g. 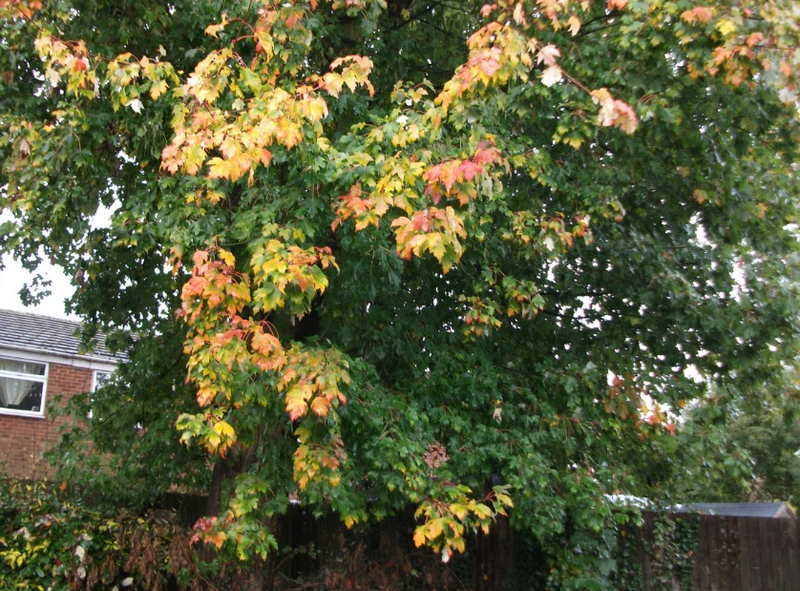 by removing say only one branch. When it came to field scale replication, to compare for example, three treatments and a control on two different soil types, where each treatment plot is a hectare, things get a bit difficult. The most that we could service, even with help (since we did not have huge financial resources), was three replicates of each treatment. In agricultural terms this seems incredibly low, where 10m2 plots or even smaller, are very often used (e.g. Staley et al., 2009; Garratt et al., 2011). 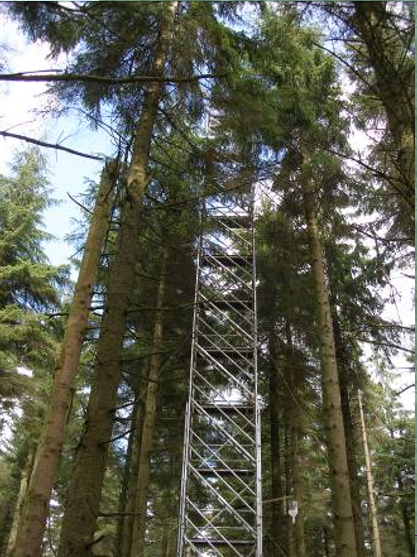 We thus ended up with our experimental papers in the really specialised forestry journals (e.g. 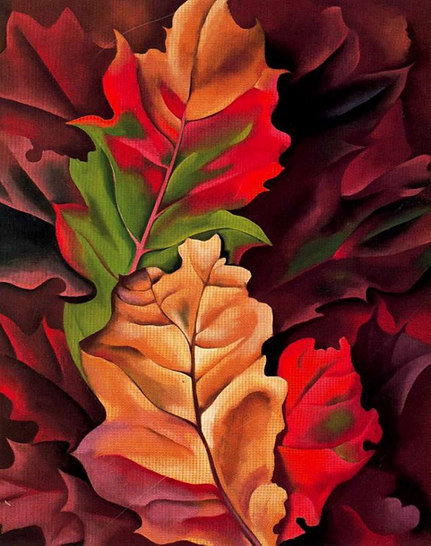 Leather, 1993; Hicks et al., 2007). On the other hand, those papers based on observational, long-term data were easier to place in more general ecological journals (e.g. Watt et al., 1989), although that was not always enough to guarantee success (e.g. Walsh et al., 1993; Watt et al., 1991). Another bias that I came across (perhaps unconscious) was that referees appeared, and still do, think that work from production forests is not as valid as that coming from ‘natural’ forests, especially if they are tropical. We came across this when submitting a paper about the effects of prescribed burning on carabid populations in two sites in Portugal (Nunes et al., 2006). We originally sent this to a well-known ecological journal who rejected it on the grounds of low replication, although we had also replicated it temporarily as well as geographically. I was not impressed to see a paper published in this journal shortly after they had rejected our manuscript in which the authors had reported changes in insect communities after a one-off fire event in a tropical forest, without even the benefits of pre-fire baseline data. We had in the meantime, given up on general ecology journals and submitted our paper to a local forestry journal. Such is life. 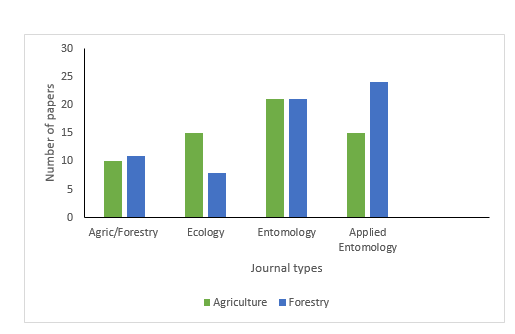 Numbers of agricultural and forestry based papers published by me in different journal categories. I might also add that being an entomologist also limits where you can publish, so being an applied entomologist is something of a double whammy, and when it comes to getting research council funding, don’t get me started! Garratt, M.P.D., Wright, D.J., & Leather, S.R. (2010) The effects of organic and conventional fertilizers on cereal aphids and their natural enemies. Agricultural and Forest Entomology, 12, 307-318. Hicks, B.J., Aegerter, J.N., Leather, S.R., & Watt, A.D. (2007) Differential rates of parasitism of the pine beauty moth (Panolis flammea) depends on host tree species. Scottish Forestry, 61, 5-10. Leather, S.R. (1985) Oviposition preferences in relation to larval growth rates and survival in the pine beauty moth, Panolis flammea. Ecological Entomology, 10, 213-217. Leather, S.R. (1986) The effect of neonatal starvation on the growth, development and survival of larvae of the pine beauty moth Panolis flammea. Oecologia, 71, 90-93. Leather, S.R. (1993) Influence of site factor modification on the population development of the pine beauty moth (Panolis flammea) in a Scottish lodgepole pine (Pinus contorta) plantation. Forest Ecology & Management, 59, 207-223. Leather, S.R. & Burnand, A.C. (1987) Factors affecting life-history parameters of the pine beauty moth, Panolis flammea (D&S): the hidden costs of reproduction. Functional Ecology, 1, 331-338. Leather, S.R., Watt , A.D., & Barbour, D.A. (1985) The effect of host plant and delayed mating on the fecundity and lifespanof the pine beauty moth, Panolis flammea (Denis & Schiffermuller) (Lepidoptera: Noctuidae): their influence on population dynamics and relevance to pest management. Bulletin of entomological Research, 75, 641-651. Nunes, L.F., Silva, I., Pité, M., Rego, F.C., Leather, S.R., & Serrano, A. (2006) Carabid (Coleoptera) community change following prescribed burning and the potential use of carabids as indicator species to evaluate the effects of fire management in Mediterranean regions. Silva Lusitania, 14, 85-100. Staley, J.T., Stewart-Jones, A., Pope, T.W., Wright, D.J., Leather, S.R., Hadley, P., Rossiter, J.T., Van Emden, H.F., & Poppy, G.M. (2010) Varying responses of insect herbivores to altered plant chemistry under organic and conventional treatments. Proceedings of the Royal Society of London B, 277, 779-786. Walsh, P.J., Day, K.R., Leather, S.R., & Smith, A.J. (1993) The influence of soil type and pine species on the carabid community of a plantation forest with a history of pine beauty moth infestation. Forestry, 66, 135-146. Watt, A.D., Leather, S.R., & Stoakley, J.T. 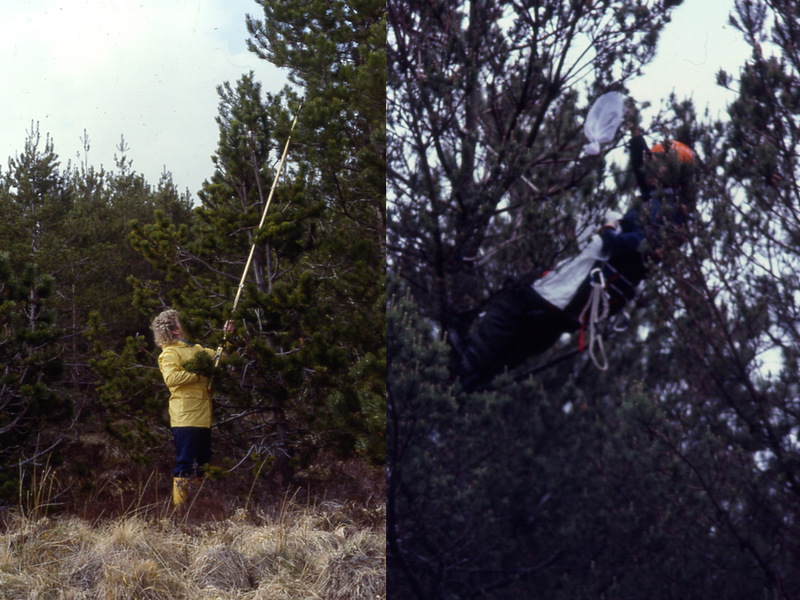 (1989) Site susceptibility, population development and dispersal of the pine beauty moth in a lodgepole pine forest in northern Scotland. Journal of Applied Ecology, 26, 147-157. 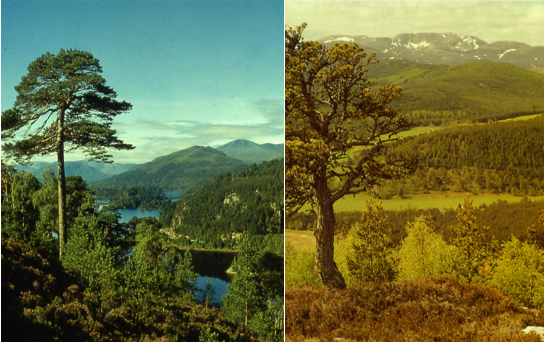 Watt, A.D., Leather, S.R., & Evans, H.F. (1991) Outbreaks of the pine beauty moth on pine in Scotland: the influence of host plant species and site factors. Forest Ecology and Management, 39, 211-221. The height of mature wheat and other cereals has decreased hugely over the last two hundred years. Cereals were originally a multi-purpose crop, not just providing grain for humans, but bedding straw for stock and humans, winter fodder for animals, straw for thatching and if really desperate, you could make winter fuel out of discarded straw**. 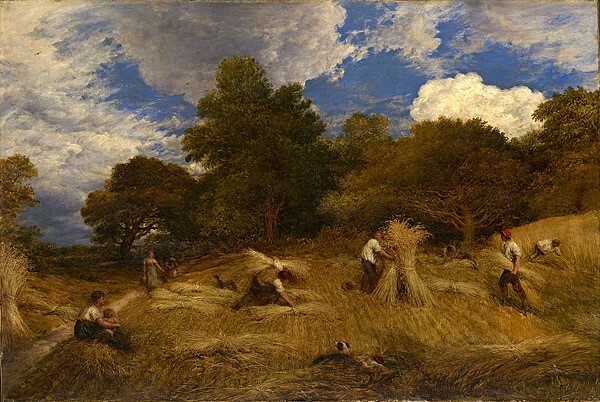 John Linnell – Wheat 1860 You wouldn’t have been able to see Poldark’s (Aidan Turner) manly chest whilst he was scything in this field! 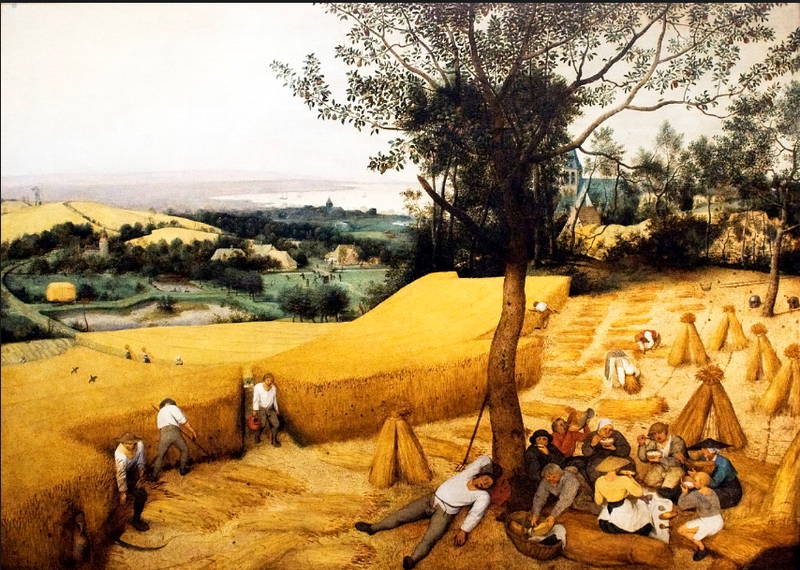 Pieter Breugel the Elder – Die Kornernter – The Harvesters (1565) – Head-high wheat crops and not just because the average height was lower in those days.